A group of local officials met with representatives from the state as well as a construction firm working on the rehabilitation of the Thomas A. Mathis bridge following numerous incidents in which the bridge has become stuck, leading to massive traffic delays and potential safety issues. Though the officials hatched a plan to attempt to keep traffic moving during future breakdowns, the news overall was not good: it may take a year to 18 months for the regular malfunctions to stop occurring, said Lavallette Borough Administrator John O. Bennett, who participated in the meeting. The Mathis bridge, which carries eastbound traffic over Barnegat Bay, was completed in 1950. Its bascule bridge opens to allow marine traffic through. The mechanical issues come after the bridge opens; specifically, its barrier gates become stuck and will now allow traffic to resume flowing. “There are new guts going into [the gates], and they’re in very good shape, but because everything on top is falling apart, it’s still not working right,” explained Bennett. Monday’s meeting included officials from barrier island communities, Toms River and representatives from the state Department of Transportation and Schiavone Construction Corporation, which is currently performing a $56.4 million rehabilitation and upgrade project on the Mathis and J. Stanley Tunney bridges. Seaside Heights Borough Administrator Christopher Vaz said his town came up with a plan to partner with Toms River during any breakdown that lasts more than 15 minutes. In such a case, he said, police departments from both towns would begin shifting traffic in both directions to the fixed-span Tunney bridge, which normally only carries westbound traffic. The plan was agreed upon Monday, said Bennett, adding that the state will be notified every time there is a delay of five minutes or longer. 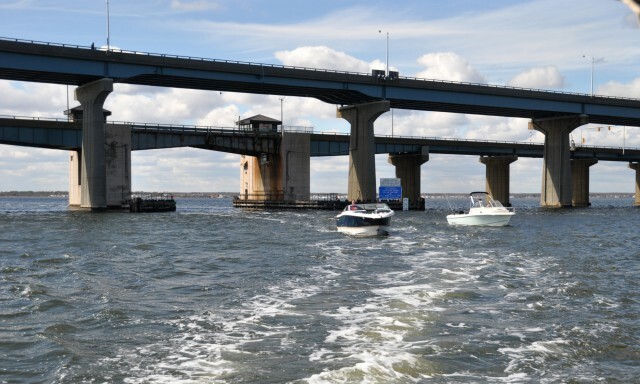 Bennett also said the group of officials convinced the state to request a modification of the bridge’s opening schedule from the U.S. Coast Guard, which has jurisdiction over the matter. As it currently stands, the bridge opens every half-hour as long as there is a vessel waiting to move through. There was no word on how long it might take for the Coast Guard to render such a decision. The request, he said, will ask for bridge openings to only occur once per hour in the morning and afternoon. “The more times it goes up, the more it could be a problem,” said Bennett. The replacement of the deck in the moveable span, flanking spans and the approach spans. Safety improvements to the barrier and warning gates and railings. Substructure and structural steel repairs. Bearing replacement and some painting. Mechanical and electrical rehabilitation of the machinery and controls.